In the 1960s, while the United States, Great Britain, and even Italy were cornering the market on Gothic horror, West Germany was busy trying to regain a foothold into a style once dominated by Germany, that of expressionistic, wildly visual cinema. The front-running entry in this could very well be 1967’s Castle of the Walking Dead. 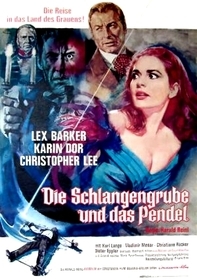 Directed by Harald Reinl and starring the eclectic trio of Lex Barker, Karin Dor, and Christopher Lee, the film is replete with eye-popping imagery, garish color, and a so-so script that add up to a product that is, if not great cinema, at least perfectly good fare for 3:00am viewing on a Saturday morning. Events unfold with an 18th century tribunal, presided over by Roger Von Marienberg (Barker), sentencing Count Frederic Regula (Lee) to death for the murders of twelve women. Regula is a practicing sorcerer who needs the blood of thirteen ladies to create a potion that will help make him immortal. 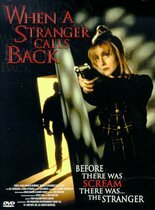 The thirteenth girl (Dor) manages to escape and help police capture Regula. The tribunal orders the Count to be tied to horses and be drawn and quartered. Just before he is killed, Regula vows revenge on the descendant children of both Von Marienberg and the surviving girl. The film advances thirty-five years, with Roger Mont Elise (Barker again), the son of Von Marienberg, receiving an invitation to stay at Regula’s near-ruined castle by, it appears, Regula himself. As a small child, Mont Elise was spirited away from his family just before they were killed by Anathol (Carl Lange), Regula’s manservant. 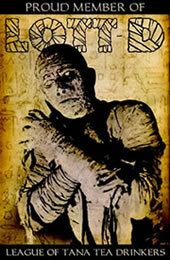 Mont Elise is seeking to find out about his ancestors and himself. Along the way, he meets with Baroness Lilian Brabont. Brabont, it turns out, is the daughter of almost-victim number thirteen. She has received a similar invite. It is later revealed that both have been lured to the castle by Anathol in a diabolical plan to revive the Count and allow him to carry out his vengeance. Castle of the Walking Dead lures the viewer in with a brutal opening sequence involving a spiked mask being forced onto Regula, followed by a lengthy and very disturbing drawn-and-quartering execution. Once the audience is drawn in, the journey through the bizarre begins. The forest that Mont Elise and Brabont traverse through in their trek to the castle, is littered with corpses and body parts jutting out of dead trees. Various color hues are offered here, from a blood-red sunset to dark blue night. The castle, itself, is shown as a crumbling, twisted fortress of death. A mix of gray stone, dirty white cobwebs, and spare torchlight. Numerous paintings, inspired by the works of Hieronymous Bosch and, perhaps, a bit by Salvador Dali, provide an appropriately bizarre air to several castle set-pieces. All of this combines to provide a treasure trove of unique and moodily sumptuous visual treats to keep the film-goer glued. Director Harald Reinl can be credited here for realizing the photographic potential of this piece. He uses the camera, several creepy props, and the color process as a palette of sorts, with the film stock itself acting as the canvas. Reinl offers an array of odd angle shots and deliberate camera movement to help increase the tension and deepen the serious tone of each scene. As Regula is taken from his cell to the village square where he will meet his doom early on, the camera follows the slow procession, never taking its focus off the iron-masked visage of Regula. This is a prolonged moment that serves to put the viewer on edge. He also cannily utilizes color from every end of the spectrum, suggesting a nightmarish dream-world state. The weird props surface in the appendage and corpse-strewn forest as well as in Regula’s surreal chemistry lab buried deep in the bowels of the castle. An assortment of bubbling blue, green, and red brews provide scary aesthetics to the proceedings. The visual aspects of Castle of the Walking Dead manage to provide one additional feat in diverting the viewer from paying too much attention to an at-times silly, on-the-whole average script that serves mainly to bridge the action bits. Character exposition is somewhat minimal, and perhaps a bit nonsensical. For instance, Regula seems to limit his revenge to just two people. You could understand his wanting to retaliate against the chief prosecutor in his case as well as the one eyewitness, but why stop there? As a villain with a super-sized ego, Regula would want his revenge against all the members of the village and, perhaps, all of society -- anyone he felt betrayed him. Secondarily, dialogue such as “time makes no difference to the dead” is somewhat ripe and ludicrous at times. Yet, the clunky wording weirdly seems to fit the goofy nature of this movie. It’s like chaos forming just a bit to show definition. Castle of the Walking Dead perfectly embodies the type of wildly florid, tangible artiness that enhances entertainment value in horror films and is sadly lacking in much of today’s output. It’s also a prime example of celluloid that tackles the “If only...” phrase. As in, if only this great-looking film had a script to match. Then again, with the eyeful of delirious image stimuli peppering the viewer, they’d be forgiven if they didn’t notice the script. This review is part of German Horror Week, the third of five celebrations of international horror done for our Shocktober 2008 event.